Abstract: Aiming for the mass markets generally means you get good value with AOpen products, and one such example of this is the AK79G Max nForce2-GT (Crush 18G) motherboard. 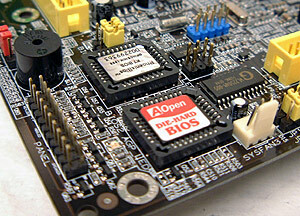 AOpen are one of the larger component manufacturers in the industry, also producing a vast array of peripherals like keyboards and even computer cases. Such is the diversity of products that it would not be a stretch to say you could just about assemble an entire computer from purely AOpen parts, even down to the very last stick of RAM. 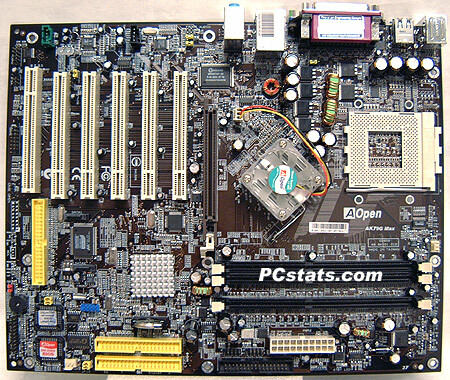 Aiming for the mass markets generally means you get good value with AOpen products, and one such example of this is the AK79G Max nForce2-GT (Crush 18G) motherboard we are examining here which is priced at about $140USD. Nvidia have recently expanded on the nForce2 lineup which originally encompassed just the nForce2-G/nForce-S Northbridges, and MCP Southbridge. The two new iterations to be added to the family include the nForce2-GT and nForce2-ST which contain the MCP-T Southbridge. The AK79G Max uses the nForce2-GT chipset, and the main difference between this and the original nForce2-G are the inclusion of IEEE 1394 Firewire, TV-out options, networking hardware nVidia have entitled 'DualNet' (basically describes nvidia and/or 3Com hardware controllers for 10/100 Ethernet) and use of nVidia's Audio Processing Unit (APU). The most interesting of these differences is probably the nVidia APU since onboard sound quality is usually a big issue with consumers, especially gamers who connect their PC's to a stereo. Nvidia's Audio Processing Unit is paired up alongside a Realtek ALC650 AC'97 codec chip and is capable of delivering a wide range of advanced audio features under the marketing-friendly name "SoundStorm." The basic situation is that the AC'97 codec handles the 'headphone circuit' (amplification, mixing, analog inputs, etc.) and interfaces to physical outputs on the motherboard such as the headphone or speaker jacks. Another device called the Digital Signal Processor (DSP), or digital controller handles the digital audio processing, effects, audio streams and other computational aspects. In the case of the nForce2-GT, the digital controller, or 'hardware soundcard' as it is also sometimes referred to is the APU. By aiming for the APU & codec approach on the Aopen Ak79G Max we have the best of both worlds - each chip handles what it is best at, and no extraneous load is imparted on the processor. Incidently, this is the configuration most good standalone PCI soundcards apply; alongside the DSP which processes the digital audio you'll find a small codec chip. There is a good explanation of this audio technology here if you are interested in knowing more of the details. With Soundstorm, there is a wide host of audio hardware-accelerated effects which we won't go into here (for more info see nVidia's site) that are intended to put a nail in the coffin of the sound card business. The big plus with equipping a motherboard with decent onboard sound is that it can be readily connected to an amp, or stereo, via a digital S/PDIF RCA or optical cable connection. Soundstorm also allows the system to make use of Dolby Digital Encoding. TV-output is another feature consumers have become accustomed to finding on their videocards as standard equipment for the last year or so. The nForce2-GT chipset incorporates this ability to output to a TV, and with the included header you can connect under NTSC or PAL signals with a standard RCA or S-Video cable. This can come in handy of you want to output a DVD to a nearby TV for example. Getting back to the AK79G Max, we find a socket A board built on a trendy black PCB. In addition to the goodies you already know the nVidia nForce2-GT chipset brings to the table (integrated GeForce4MX videocard, LAN, IEEE 1394, and TV-out) we also find two Serial ATA headers, three ATA133 IDE headers, 5.1 channel audio, dual BIOS for security, and much much more. As you can see the AK79G MAX is very well equipped, in fact the board is easily one of the most well equipped motherboards we have ever tested. The AK79G Max supports 200/266/333 MHz FSB AthlonXP based processors as we expect. What is not certain is whether or it not it also handles the upcoming 400 MHz FSB AthlonXP. Officially the word is "no," but with the correct components and a little overclocking... who knows? With its three DIMM slots the AK79G MAX can tackle as much as 3 GB of PC1600/2100/2700/3200 DDR RAM. Best results are had when two sticks are paired up in a dual channel DDR configuration, and if you overclock the memory voltage can be adjusted from 2.5V to 2.65V. The AK79G MAX is a pretty big motherboard, measuring 30.5x24.5cm, but that's not surprising considering the high level of integration. The main ATX power connector is in a good location at the right of the DIMM slots, as is the floppy drive connector incidently. It's nice to see even though the AK79G MAX is highly integrated, AOpen still included five PCI slots should you want to expand the motherboard further. We were surprised to find that the AK79G MAX had a universal 8x AGP port instead of the standard 8x AGP port with 1.5V lock - the thin partition in the AGP slot itself which physically prevents old-style 3.3v cards from being installed. Thankfully for you, Aopen have implemented some custom circuitry to prevent damage to the motherboard and chipsets in the event a misguided person installs a 3.3v AGP 2X card in the universal AGP socket. I tested out this with an older TNT based AGP 2X videocard and the AGP warning LED lit up, and prevented the board from powering up as it should have. By the way, if it isn't clear, NEVER install an AGP 2X 3.3V videocard in an AGP 4X/8X 1.5v socket. Don't do it. Don't think about doing it. Don't even "just test it out." There is an interesting footnote in the manual for the AK79G Max that also states DDR400 memory is only supported when an AGP card is installed and the onboard video function disabled in the BIOS. When running on integrated video the highest supported memory type is DDR333.